Energy drinks have become increasingly popular amongst health minded individuals over the last decade for the extra "kick" they can provide before or during a workout. Not only that but they have become a staple for students wanting to stay up late studying for exams, and even made their way into our everyday lives by being available in office vending machines, and at your favorite bar as an ideal mixer in alcoholic beverages to keep you from passing out all over your friend like a Jersey Shore housemate at 2am in the morning... although I vaguely remember consuming one two many Vodka Red Bulls a few weeks back and still managed to eat the pavement. But whether you are consuming them with your favorite tipple, or as a much needed energy kick at 3pm in the afternoon, do you really spend the time to turn over the bottle to see what's inside? Today we are going to look at the ingredients in a regular Red Bull and why some of those ingredients may not only be detrimental to your health, but can interfere with your quest for a better body. Think energy drinks like Red Bull are better for your waistline than soda? Well they're not. 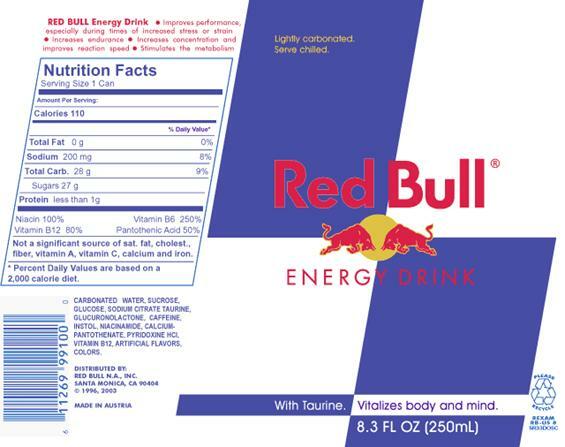 One can of Red Bull has 27 grams of sugar, which is roughly the equivalent of 6 teaspoons. Still not hitting home? Well let's put that into perspective. A Dunkin Donuts Glazed Donut has 19 grams of sugar, Reeces Peanut Butter Cups have 21 grams of sugar, and a Twix Bar has 28 grams of sugar. So you are basically eating the sugar equivalent of a candy bar. The whole can itself only has 110 calories, but all of that is coming from sugar. You could throw 6 teaspoons of sugar in your morning coffee and basically get the same effect for much cheaper. There are 200 milligrams of sodium in one can of Red Bull, 50 milligrams in a can of diet coke, and 40 in a can of regular coke. 200 milligrams isn't going to kill you, but there are large amounts of hidden salt in many of your foods and beverages. The recommended daily intake is between 1,500 - 2,400 milligrams per day, and currently Americans are consuming up to three times that amount which can lead to high blood pressure, stroke and cardiovascular disease. The next relevant ingredient is Taurine. What is it? It is a colorless crystalline substance that is extracted from the bile of mammals which is found primarily in the lower intestine. Mmmm Yummy! Lucky, or unlucky, for you the Taurine that Red Bull uses is synthetic. Lucky that you aren't ingesting animal intestines, but unlucky that synthetic Taurine has been reported to cause high blood pressure, stroke, seizures and even heart disease. It has been banned in some countries including Switzerland, so why do they throw it in your drink? Well because there isn't enough evidence pointing to the negative effects above, and they rely on the positive research that shows that Taurine is an antioxidant, and provides some health benefits. The problem is that the health benefits associates with its use are from natural occurring Taurine, not the synthetic type. Michael Pollan has an incredibly eye opening book called Food Rules. In it he talks about how and why we are becoming fatter and illustrates how the food industry has changed for the worse. One of his rules dictates "Don't eat anything with ingredients a third grader couldn't pronounce" and it's a good rule to live by considering most processed and refined food items contain such ingredients. Glucuronolactone doesn't appear to be harmful and has been reported to promote energy. There was a crazy rumor floating around the internet that it was an experimental; chemical that was used in the Vietnam War that was banned because it caused brain tumors, but those rumors are completely false and fabricated. Where does most of the buzz you get from drinking a Red Bull come from? Well to be honest if you are drinking the regular variety the buzz you are most likely getting is a sugar high, but the energy most likely will be coming from the caffeine. One can of Red Bull contains 80 milligrams of caffeine. Mountain Dew has 55 milligrams, Diet Coke has 45 milligrams and a Starbucks expresso has roughly 58 milligrams. Caffeine is one of those drugs that is constantly getting mixed feedback on from the health community. Some say it has positive effects such as improving reaction time and concentration and even aid in fat loss, while others argue it is addictive, can lead to panic attacks, and pregnant women who consume more than 200 milligrams of caffeine per day are more than twice as likely to experience a miscarriage. Otherwise known as Niacin or Vitamin B-3, Niacinamide is one of the better ingredients in Red Bull. It is essentially safe and does have health benefits such as lowering cholesterol however you would have to drink a ton of cans to get any such benefit. Side effects of niacin are rare but have been known to include flushing of the skin and liver damage, but once again it would need to be consumed in large quantities. Otherwise known as Vitamin B-5, and is a water soluble antioxidant that helps break down carbohydrates, fats and proteins. It is also used to treat heart burn which may come in handy as your stomach has to process those 6 teaspoons of sugar you just guzzled down. 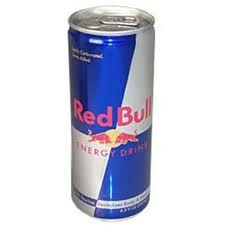 There are no reported side effects or toxicity, particularly in such low does that are in a can of Red Bull. Another ingredient a third grader would find difficult to pronounce. It is a calorie free artificial sweetener that is 180 times sweeter than table sugar and often blended with other sweeteners to mask it's slightly bitter aftertaste. The FDA has approved its use here in the US however some critics believe it could be carcinogenic (causes cancer) however this has yet to proven. Aspartame is another artificial chemical sweetener and otherwise known as "Equal" or "NutraSweet". Google it and an endless supply of webpages will show up that are devoted to telling you how bad it is and that possible side effects include cancer and brain tumors. The FDA has approved it's use in food and beverages as there is no concrete evidence that this is indeed the case. However there are also other sites show how people who have removed it from their diet have found their health concerns have gone away. Sugar may be bad for your health, but this could potentially be worse. I guess we will have to wait and see. So there you have it. Ingredients that make up both your regular and sugar free Red Bulls. If you find yourself at a bar and order one with your favorite cocktail, truth is that the alcohol is probably more detrimental to your health. However if you find yourself consuming these on a regular basis to provide you with a much needed energy kick in the afternoon, you may want to consider some healthier options with less chemical additives. It may give you wings, but it could also give you heart disease or even make you fat! Starbucks equipped with newer espresso machines actually pull 89 milligrams of caffeine per shot now, or at least they do in Canada. All in all, the espresso shot or Red Bull both pull in well under an average cup of coffee - though Starbucks does appear to be particularly caffeinated. I totally agree with this blog. 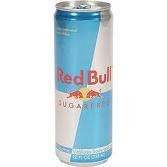 I never knew all of that garbage and chemicals that can potenially harm your body is in just a single can of red bull or pretty much energy drink. I use to drink a lot of energy drinks now I am glad I stopped. I use to drink them to stay up to do extra working out or studying. Even the sugar free too! It seems like it is all bad. Thank you Adam for the great information. Most of this stuff is alredy Known by lots of people, except the ones ACTUALLY Drinking/eating those damn stuff, Yeah I rather have natural ways of eat, so when you need to stop by to a Mcdonalds for a fast food, well It barely will make a Dent in your health as 1 time a year or less isn't that bad. Was writing a paper on redbull, and it's advertisement influence. This really helped, changed my view completely on the consumption of this product. who else is reading this while drinking a red bull?